Twenty-four-year-old Rebecca Bell graduated from university with a business degree but decided on a more creative career path. Now she operates her pottery retailer, Willow Bell, from artisanal markets and events. We spoke to her to find out more about her business, the market scene and to get her invaluable advice to other small-business owners. I had been working full-time in a financial role throughout studying and wanted something different. I grew up in hospitality and am far more settled in an events world than my office chair – although I do love a good spreadsheet! Willow Bell had been on the idea board for a while. At the time, my one-year-old was flat out by 6pm every night, but what should have been heaven left me with idle hands. In November 2015 I started to provide items for restaurants, cafes and a couple of pop-up displays. In March 2016 I finally made it onto the market scene – after a couple of rejections (but we don’t hold grudges). The business has evolved ever since and continues to do so. It was always intended to be a showcase of beautiful items, handmade with love and skill. Why did you choose the name Willow Bell? Blue Willow is a traditional pattern – probably the best known in pottery – and a willow bell is a blue and white flower. My first print was lemon blossom blue, which is still a central product. The name gave the business an identity for customers to buy into. Where does your pottery come from? What makes is so special? 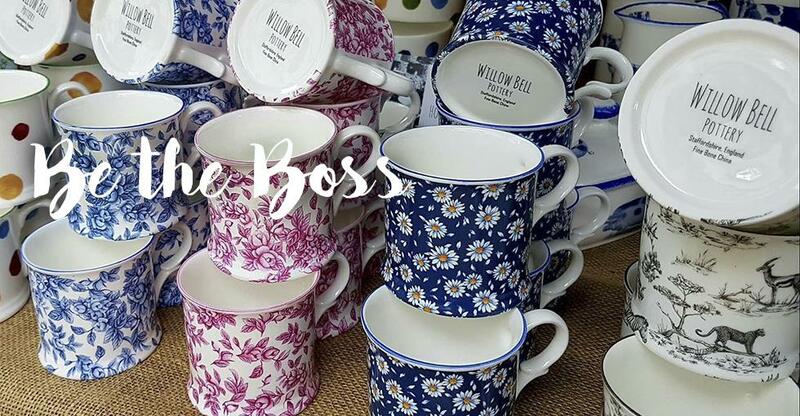 All Willow Bell pottery is Staffordshire fine bone china made by hand in the heart of Stoke. The people who make it are passionate and the passion shows. The decorations are also from a family-run, Stoke-based company. Despite their designs making it onto some of the larger players in the pottery and ceramics industry, they are still the original family from 1948. The china seems to evoke a nostalgia and pride in something that was, and still is, very British. Whether it’s something they grew up with or a new concept for a first home, it’s a heart-warming product. I love that, despite the delicacy surrounding china, there is no strict customer profile. I have as many male customers as female and young as well as old customers. I sell country animals in the city and London prints in Manchester. People coo over a teapot – and that is at the core of the marketing. Can you take us through the process from design to end product? The china is handmade from locally sourced material. I have a fantastic relationship with the business, which accommodates my customers’ requests. The decorations are hand applied, the rims are painted or mottled depending on requirements. Once sealant is applied they are fired once more. I’d like to say the decorations are studied and consulted before use. Unfortunately, it’s far simpler: I fall in love with a print, test it via social media – Instagram mainly – produce some mugs and test the water. The markets allow me to check customers’ likes and dislikes easily. They tell me what they’re looking for and we can create it together – a bonus of being a small, local business. Do you have any plans for the future of the business? I love being a part of the monthly markets. The passion from both customers and other traders is infectious. A monthly event draws in new customers but allows existing ones to miss you enough to hunt you down. The county shows and one-off events are a fantastic platform for reaching a greater customer base and force you to be creative with stall and product design. They vary in size and customer base and require a great deal of adaption. They keep it fun! The publicity from the intense marketing of these events is incredible. Investment is the main theme of my plans. Packaging and location are high priorities. I’m searching for the right premises to accommodate a workshop, store and shop front – a base for customers to see everything on offer beyond the 6ft market table. I want to grow a small team to keep customer service exceptionally high as I become busier. I have thus far personally dealt with all orders and deliveries, but know this must change to achieve the same level of service. My business is too small to incorporate original prints, but it’s my dream and plan to do so. I have a fantastic support system in my family and partner. My mum has a fantastic way of keeping me motivated. She helps man events when I double up and is the best display ‘faffer’ I could wish for. She is right behind me taking pictures and posting on social media and is the business’ greatest champion. I am still learning every day, but there are a few constants. Marketing. I’m a firm believer in the power of social media – particularly when you don’t have a permanent base. Take pictures, interact, tell people where you’re going to be – before you get there. Otherwise, how will they know where to find you? Marketing before, during and after each event is a given for me. There is always time – do not make an excuse. Ninety percent of my social-media marketing is done from a phone or tablet in bed. Keep it positive. No matter what conditions you turn up to – bad weather, bad location – never tell a customer that you think the mud is atrocious. It astounds me how many people post about events while setting up. Simply tell them to bring their wellies and have a fabulous time. Teamwork. Embrace your neighbours. The more successful the footfall and customer interaction the more chance you have of having a successful event. Include the event planners with thousands of followers. It’s a mutually beneficial relationship: the busier they are, the busier you are. Tag the next stall who sells pies into your posts. Chances are, customers who come for the pie bring someone who likes your mugs. We’re all in this together – the days are long and hours unsociable. Love what you do. Passion is something you don’t force. It oozes from businesses who love what they do. Smiling through every “I have a cupboard full of china, I don’t need any more mugs” doesn’t need to be demotivating. Stand tall, be positive and remember why you started that journey. Being your own boss can be fantastic, but you certainly get out what you’re willing to put in. The hours are long and the pressure is real. There are far easier ways to make money – but you’d go far to find the same level of satisfaction.